This week has been deemed Education Week by legislative leaders, who have invited superintendents, principals and teachers from across the state to Raleigh to discuss public education issues. As education leaders and teachers share their thoughts and concerns regarding public education, funding has been a key part of that conversation. With consistent improvement in proficiency rates, National Assessment of Educational Progress (NAEP) scores, and graduation rates over the past 20 years, North Carolina has long been recognized for its commitment to public education – both K-12 education and higher education. However, significant cuts made to K-12 and higher education in recent years threaten to erode the leadership position the state has achieved among southern states. As lawmakers work to craft and approve a biennial budget for FY 2014-15, investment in public education will be a central part of the budget debate. As the state continues to recover from the Great Recession, the number of students in public classrooms across the state has continued to increase at a modest, but steady, rate. Despite greater levels of student need and a growing student population, North Carolina is investing less in K-12 education. 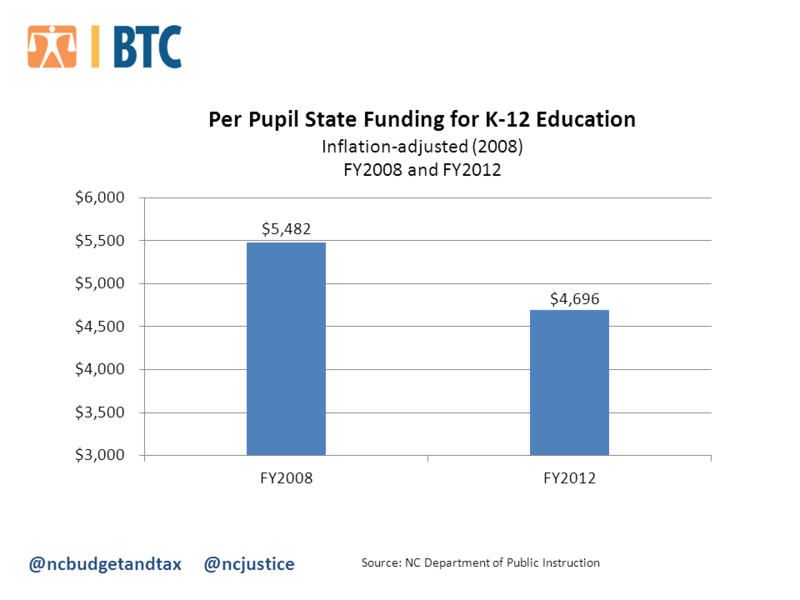 Compared to FY2008, per pupil state funding was 14.3 percent less, $786 per student, for FY2012 when adjusted for inflation. Local school systems have had to make difficult decisions and teachers, administrators, parents and students are feeling the impacts. Public schools have cut more than 6,100 teaching positions, including more than 2,100 through layoffs, since the 2009 school year. Funding cuts have been made in areas such as textbooks, technology, classroom and instructional material, personnel support as well as literacy coaches. School systems have been allowed to increase classroom sizes above mandated maximum limits. School systems have increasingly been challenged to do more with less. Tax credits for private or home schooling would provide dollar-for-dollar tax credits to families with children attending private school and home-schooled students. Such tax credits redirect dollars from public education and reduce state tax revenue available for public investments. Investment in technology that promotes and enhances student learning. State funding for technology decreased from $10 million in FY2009 to $0 by FY2012. Local Education Authority adjustment – the amount of state funding local school systems are required to reduce their fiscal year budgets. Since FY2009, these adjustments have totaled more than $1.3 billion in state funding cuts. Investment in teacher development to ensure that North Carolina teachers are able to align classroom instruction with various student learning objectives, such as the Common Core State Standards initiative. Education Week presents an opportune time for policymakers to better understand the challenges that school leaders and classroom teachers face in their efforts to educate nearly 1.5 million North Carolina students. Declining support for public education has made a real difference in the educational experience for our children, whether this entails longer bus rides, fewer textbooks in the classroom or fewer hours with a teacher. This year may be the year that policymakers recognize the need to reinvest to compete.